We are pleased to announce that, taking effect on May 1st 2018, International Surface Technologies, owner of Canablast, ISTblast and ISTpure trademarks, has decided to consolidate all of its brands under one identity International Surface Technologies (istsurface.com). We are confident that the consolidation of our brands will make the market implementation our products easier and will better reflect our growth in international markets. Since its inception in 1978, the name Canablast was mostly associated with blasting cabinets, portable sandblasters, blasting rooms and automated surface treatments systems. In 1999, the International Surface Technologies corporate identity was introduced to better achieve our objective in developing international markets and pursuing new opportunities in surface treatment technologies and processes. Additional innovations followed with the introduction of ISTblast, a line of surface treatment robotic systems, and ISTpure, a line of solvent recovery systems as well as industrial parts washers. Today, with the aim of consolidating the future while retaining the experience of the past, we are opting for one designation International Surface Technologies as our unique corporate identify for our future business activities. 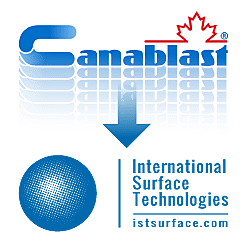 Therefore, all of the Canablast sandblast product offerings will now be branded as ISTblast. With these exciting changes, our company will consistently remain committed to meeting and exceeding our customers’ requirements, thanks to our passionate and dedicated people consistently creating innovative designs and producing world-class surface treatment equipment. For more information, you may contact Alain Doyle, President and CEO, using the contact information below.